On September 12, 2017, Lauri Strauss, CEO of design2 Last, gave a presentation to the Whatcom County Council’s Finance and Adminstrative Services Committee regarding anticipated renovation to the existing county jail facility located adjacent to the Whatcom County Courthouse in downtown Bellingham. Council Members Rud Browne, Ken Mann, and Satpal Sidhu are all members of that committee and were present that day, along with Council Members, Barbara Brenner and Todd Donovan, who participated in the discussion after the presentation. I have put together some detailed notes from the meeting (available below my perspective here) so that people have access to this information to consider in written form (the meeting minutes are not posted yet) as we proceed toward the November 2017 general election which includes the ballot measure 2017-6, for a .02% sales tax to provide for construction and operation of a new jail facility. During most of Ms. Strauss’ approximately 15 minute presentation, she explained the portions of the July 2017, “Building Assessment Studies and Cost Estimates” that design2 LAST had prepared that basically comprise a proposal for the first set of incremental repairs to the jail that Whatcom County Executive Jack Louws has been referring to in previous county meetings. Since our county has postponed, for a good 15 years, addressing these life safety issues that have been present at our current jail facility, it is distasteful and dishonorable that officials are not ready to take full financial responsibility for this delay and violation of addressing human safety issues, for those incarcerated, those who work at, and those who visit the jail, by fully renovating the jail and bringing it up to code. What’s more, having a design consultant firm operating under this same motivation to delay addressing life safety issues under the injurious premise of a new jail being on the horizon (as Executive Louws alluded: “It was…the year 2000 when the first consultant said that we need a new jail,”), appears to just be condemning jail workers and jail residents to living under specific threats of catastrophe indefinitely and unnecessarily. In light of this apparently callous approach by county officials, it was frustrating to hear a lack of outrage from council members in response. Council Member Browne’s comments seemed to support the same old destructive approach. Council Member Donovan did voice frustration with dealing with the seriously delinquent action regarding these life safety issues, but without demanding resolute and immediate action to change this approach. And Council Member Mann disturbingly spoke as if his resistance to championing a new jail was nearly futile, additionally making a point of thanking the administration for being willing to currently invest in the most nominal of renovations. Remember the “major dangers of the jail,” that Council Member Donovan referred to – the smoke evacuation system – would not be among the renovations recommended at this time. According to the question and answer session that followed Ms. Strauss’ presentation, it appears that Council Members, the County Executive, and Sheriff Elfo have all given thought to strategies of how renovations can be done to the jail by arranging capacity at other facilities in our county and by contracting with other county jail facilities to lessen our jail population temporarily. We also know that the Incarceration Prevention and Reduction Task Force is working in cooperation with such committees as the Triage Facility Ad Hoc Subcommittee, Behavioral Health Ad Hoc Subcommittee, and the Legal and Justice System Ad Hoc Subcommittee, to establish measures to reduce our jail population on an ongoing basis. Meanwhile, even though there was this messaging at the September 12, finance committee meeting about how challenging it would be to bring the building up to code, and how some solutions would be complex – even daunting – no one present said it couldn’t be done. In fact, most all of the negative elements about doing the work to bring the building up to code had simply to do with not wanting to spend the money to do it and the fact that the current proposal for a new jail (which we have no reason to believe will be moved forward by voters who said no last time) calls for demolishing the downtown jail. The sad reality is we have been put on notice for over a decade and a half about unsafe and inhumane conditions at our county jail facility in downtown Bellingham, all during the time officials have been talking about building a new jail. This strategy of putting the lives of both voluntary and involuntary captives of the jail facility in jeopardy for the sake of obtaining a new (and in many ways, more threatening) lock-up facility has not worked in all that time. It’s time to address the inhumanity of our current facility all-out and head-on, taking full financial responsibility for past purposeful delays. If, while we are bringing our current facility up to code and while addressing overcrowding with meaningful solutions to preventing and reducing incarceration, we come up with a design for a new facility that is cost-effective and is an improvement for safely and humanely housing those who pose a danger to our community, then we can confidently move forward with that plan. However, making the jail safe and humane has to be entirely separate from the potential of a new facility. Write our local officials and tell them so and vote NO on 2017-6. Lauri Strauss design2 LAST: [begins at 5:00 mins.] She is catching people up on work her team has been doing on the existing jail. A presentation was done last October on Phase 1A. There’s a large group of people working on the project which produced a lengthy report. The Phase 1A review was a rapid assessment of the existing jail on overall function, the timing of when it was built. Facilities folks and jail staff were spoken to and came up with a broad overarching review of the condition of the facility. A minor shifting of functions would not solve some of the problems. Looked at overall systems and overall lay out. They came up with a list of items that the county selected for us to move forward with and do a more in-depth review of and that’s what they are calling Phase 1B, which has just been completed. There was a list of 20 or so deficiency items, that were not only physical but operational. From that the county selected ten (chronic problems that have come up in the jail) that were looked into more in-depth. Some of the Phase 1A priorities: The doors/security locks in the jail were a problem; smoke evacuation system, there is not one in the jail (this is a current code requirement but was not when the jail was built); delay issues with the lighting, among other things. The list of tasks that design2 LAST was tasked with to review in-depth and price them out/decide if they were worth implementing with the thought that this jail just needs to be operational until the new jail gets built. Worthy of noting, the cost of these items doesn’t take into account some of the logistical issues that the county is going to have to overcome, like moving prisoners around, moving staff around, closing certain spaces down for a time. All of this will be worked out as they start going through the design process. We want to identify those things right at the beginning of the process before they get through it. The existing generator which they heard a lot about, is at maximum capacity so nothing can be added to it. There are a couple tasks that would require a new generator. Should the county decide to move forward with one or more of those tasks D2L would recommend a new generator and it would address all of those issues so there would be a cost benefit from doing that. The first issue was seismic bracing on domestic water piping and heat generating systems. None of the equipment is currently seismically braced, which is a current code requirement. It wasn’t required when the jail was built. They came up with two scope options that they could do to break down the what the logistics of doing these would be. Seismic restraint for the equipment on the roof and the boiler and electrical rooms which are off the beaten path of the jail itself – out of the operation area. Then they looked at other areas. What they have recommended is not implementing either of these scope options. They are fairly expensive. It will take a lot of logistics to implement these options. There’s a lot of demolition that will have to be done to implement them. For a five to ten year operation of the jail, they felt it wasn’t worth the money. Next were issues of failures of the domestic water distribution systems. They found they couldn’t identify these because all of the water distribution is in the walls. Without doing destructive testing they could not identify where these things were. The options are to monitor the water systems. The county says they just fix these things as they go along. These are fairly low cost items. Maybe the water can be monitored to see if the copper is failing early. They felt for the next five to ten years this would be an ongoing maintenance issue that is going to have to be watched. Fire sprinkler coverage is a bigger one. They identified three scope options and they feel all three of them should be implemented. Option 5-3 is a fairly easy one. They noticed where there are other pipes being hung from the fire sprinkler pipes, rather than from the actual structure, and a few heads that were missing, so going in and fixing those. There are no fire sprinklers in the housing units, which is a current code requirement. If we were building a new jail you would get that. They think that should be implemented because it is a life safety issue because of the restriction of movement in the housing units. 5-2 are other areas that they noticed were un-sprinklered. It would be easy to do that at the same time that they do the housing units. D2L recommends moving forward with all three of these and this would be the highest cost option that they are looking at. Task number eight was kitchen equipment. A lot of it is older and has either been repaired throughout the years or needs repair. They identified three options and the fourth option is actually putting the freezer and refrigerator equipment on a generator. They are looking at a package unit generator that is big enough to take care of the kitchen refrigeration equipment itself and it could be a unit that you move to the new jail if decide to move forward with that one. It’s repairing and replacing some things and the replacement equipment could also be moved to the new jail. They would make sure they would coordinate any equipment that they could move to the new jail. Those are not hugely expensive items, but are well worth it and would keep the jail operational and healthy for the next five to seven or five to ten years. The door locks were a big issue. They evaluated every door in the building. From the basement commercial doors standard used in office spaces, to the other levels of the jail, as those in the detention cells. They evaluated each piece of hardware. In the report there are a lot of scope options and they are trying to group the repairs and replacement issues into: five doors need new closers, and seven doors need new locks, etc. So they have grouped them that way. When it comes down to it they think the cost is very beneficial and it’s urgently needed so this is something to move forward with and they recommend that. They took all of the scope options as one item and it would be easy to group those into a set of design documents that could be bid on. They had some complaints that for the emergency lighting, when there’s a power outage, there’s actually a delay of when the emergency lights actually come on. The emergency lights are on a generator. They came up with several different options. 12-1A and 12-1B are going to achieve the same goal. 12-1A is a more permanent solution. You put in a converter. You add it to the generator. If they were designing a new jail, this is exactly how they would do it. In this case, they looked at 12-1B which is adding battery-pack emergency lighting in those spaces. You can get detention grade light fixtures like that. They think that is fairly important and think it is a low cost fix for the benefits. This would allow the lights to stay on when the power goes out. There would not be any delay. When the power comes back on, however, there would be a little bit of a delay unless they can put it on a generator. This is one of those issues, if they are going to do a generator to have the kitchen power on, they could actually add enough space to have the lights on as well. So that would be another benefit of the generator. These are easy and quick things to do and the benefits are good for the jail. Lastly the sanitary waste pipe in the basement is another issue they had. There have been ongoing issues about the waste-piping. A lot of them are small items they can fix fairly easily. They just need to get it into a project and get it moving. The biggest one is the pipe in the kitchen that just keeps backing up and they’ve heard that the slope on the drain doesn’t go the right direction, so actually what they are recommending is to add a sump pump and a collection system that would pump that out. There’s room to do that down below but there’s not room the change the slope of the pipe. The clothes washing machine and that drain that comes down in that room downstairs need some corrections to that. Right now the drain goes from a large size to a small size instead from a small size to a large size which is kind of backwards. So they would do that and add some ventilation to that room. More benefits than cost to these items, so they recommend this being done. The scope options together that she presented that day are about $4 million which tracks pretty well with what they said in Phase 1A. The complete list of scope options would be in the $10 million range which similarly tracks well with Phase 1A. They understand that accomplishing the projects will be a logistical challenge. A lot of planning will have to go into it. They think it can be done. There’s been work done in the jail before so they think it’s not a problem and will just require coordination and that they do all of that up front. The doors and the drainage things are fairly urgent so they are ready to get started as soon as the council lets them know what they need to do. Council Member Sidhu: [21:30 mins.] On page fourteen, regarding emergency lighting delay, the first recommendation is for adding a generator for the emergency lighting for $350,000, and if you add up the bottom other four options it’s about $175,000. If the county does spend $350,000 for the generator, would it eliminate all the other four? Lauri Strauss: No it would eliminate the first one. It’s in the housing units. Council Member Sidhu: So we are looking at $225,000 difference. Do you think if we can have a generator that later can be used, it would be a better solution to do this rather than limp along next four years? Lauri Strauss: Dont get me wrong 12-1A is not only a generator, it’s a UPS system, so it’s more than just a generator. Council Member Sidhu: But the total cost is $350,000? Council Member Sidhu: So even though the cost is more, it’s a permanent more reliable solution and and the generator can also be used or planned into the next facility. These generators last twenty years or more. Council Member Brenner: [23:30 mins.] In some of the stuff where there’s all that leakage, is this going to make sure that mold is removed? Lauri Strauss: They hadn’t gone in to that, but yes, if there’s mold they would definitely have to have it all abated. Council Member Donovan: [24:00 mins.] Would the generator that goes in the kitchen, would that also be able to run the backup lights? Lauri Strauss: Yes. The generator is a package unit, so it’s in a little trailer outside somewhere so it could be sized so it could handle both of those. Council Member Donovan: His big question is the smoke evacuation system. When did the code change? Lauri Strauss: It’s interesting, it actually changed right as the jail was being constructed in the ’81-’84 area. That’s when the fire codes were changing. Lauri Strauss: The problem is with implementing the revision. There’s security issues. We can’t get the air that needs to be moved. We’d have to shut down a couple cells to use them as air returns. They were still not sure it would meet code. They couldn’t get all the issues solved to make it code-compliant. In each unit you would lose two cells. There’s five units. This is one of the items that pushed them to say that we need a new jail because it’s difficult to get that to work. Council Member Browne. Ten cells would be eliminated. Mike Russell: It’s difficult to make it feasible to do. If we look at remodeling the jail, we are going to have to bring the whole thing up to code. Everything, in order to maintain this jail for any length of time. If we’re making efforts to make repairs on this jail for life, safety, and the safety of the inmates, we can do that for four, five, or six years. 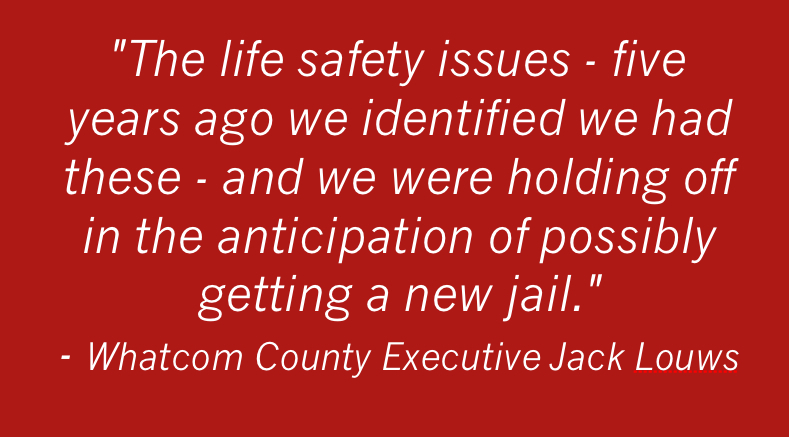 Whatever it takes to get “the new jail up and running,” to show we’re moving towards that. Council Member Browne: [27:45 mins.] Wants someone to tell him if ten cells are eliminated, how does that reduce the population/capacity in the jail? Executive Louws: We don’t have a whole lot of individual cells. Obviously they’d pick as many of those up as reasonably possible. But in some of the pods they’re all multi-cells some are four-person or maybe more. So if he was to average, maybe one and a half to two. He would say fifteen to twenty bunks are what would be lost if they were to do that. He wants to add that they are bringing the council up to date, that they are in progress in putting together what they’ve determined are the most critical life safety issues that we can do to keep us going. The county is spending over $1 million a year on repair and maintenance in the existing facility plus the $2.5 million they spent on electronics over the last five years. This will be the first time they will have gone through and completed some renovation. This is just to keep it going. But this just keeps us going. The point necessary to remember is if we decide to do an expansion of the medical facility or or progamming space is put in or we want to put a mental health wing up or we want to expand, building and code is going to require us to bring 100% of this facility up to current code. That’s one of the difficulties we have with this facility. We are talking a new jail within an old jail to make that happen. He doesn’t know how they’re going to do it. This project is feasible, although it’s going to be extremely difficult. It’s not necessarily one he’s going to want to manage or have his name on, but he thinks they can get it done. The next step is to get contract documents together and get it ready to go out to bid in the next year and to have this thing ready to go. “I believe that the $4 million is where we need to go. The life safety issues, five years ago we identified we had these and we were holding off in the anticipation of possibly getting a new jail.” It’s just gotten to the point that the county has to add this on to the cost of the new facility and then if they aren’t successful here and they don’t do anything different, these repairs won’t be duplicative of what they’re going to need to do in the future putting money into it. They’re not going to have to rip any of this out or off to continue doing major system renovations to the existing facility. Council Member Sidhu: [32:20 mins.] He thinks November should decide a lot of things for them: which direction they pick and how much money they spend. This $7 million may actually be $10 million. Once things are opened up you don’t know what’s needed. Executive Louws: And as challenging as the project is, we may not get a bidder for it too. Council Member Sidhu: If they look at this $10 million and even if the public does vote for a new jail, would it be a good option for us to have a contract with Skagit County for four years and put a significant number of inmates with them because they are at the starting of their jail? They built at over capacity and rather than keep putting money into something and then come four years, we’re going to demolish it. We are in a jeopardy situation. It may be that we will help Skagit County pay for some part of their jail rather than putting it in concrete and then pulverizing it. Somebody gets benefit. After November they should seriously think between Yakima and Skagit County of we can reduce our population to half so it’s manageable. Executive Louws: [34:15 mins.] The Sheriff is requesting through the budget process, additional staff out at Irongate that would allow for them to have four people on staff on an ongoing basis and with that they would be able to take more of a higher risk classification over to that particular unit and be able to pull in and utilize that facility more. The Yakima contract is in the packet for the Council Members’ consideration. They have the Score contract for possible going down there. Skagit is on the table if they have space and personnel needed. Mike Russell: We still have to address the life safety issues. I don’t think we can turn our back on those at this point. The inmates can kick some of the doors open. There are flooding and sprinkler problems. We’ve been put on notice that these problems are here and we have to move forward somehow to address them. Council Member Donovan: Going back to the smoke evacuation system and kicking the doors open, these aren’t things we’ve been waiting five years for. They’ve needed to be done last thirty-five years. Everyday people are asking him, didn’t we already approve money to fix this jail? Whether it’s five or ten more years – he’s looking at this is $4 million that I don’t want to spend. But it’s $4 million dollars that should have been spent ten or fifteen years ago, when it would have been cheaper and he doesn’t know how to explain to people, we haven’t done it for the last thirty-five years, so we’re going to keep not doing it because it’s an awkward thing to have to do. Executive Louws: [37:00 mins.] It has been identified. It was fifteen years ago or the year 2000 when the first consultant said that we need a new jail. He brings back five years, since that’s how long he’s been around. We did make a conscious decision to try to get the new jail. Things are taken care of on a one-off basis. Now we’re to that critical stage. If they knew what they knew today they could have had that contract five years ago. But, now we need to systematically take care of some things, doors, sprinklers, light safety. There’s going to be big decisions to make if the ballot measure doesn’t pass. This project will take one and a half years to two years to get it done. The next step is what will be done for the medical and other good stuff. That’s when the trip for the next big dollars is going to come. We need money to make that happen. The sheriff is asking the representatives of the jail management team in Novemeber to let people know the direction they are moving. He hears, we should be doing repair and maintenance. We do a lot each year but this is the first time we will be doing system maintenance in a big way. It needs to be done. Council Member Mann: [39:45 mins.] He wants to credit the administration and everybody for stepping up to pay for these repairs because he knows it’s painful and difficult. He knows he is one of the “diminishing few” that think we can cut down on the jail population and keep our existing jail. He wants to credit the administration for being willing to spend the money that we do need to spend and then have to demolish that building. He knows this is unpleasant. Maybe we will get to keep that jail and figure ways with alternatives and electronic monitoring to cut down our jail population enough to keep that building. Browne: [41:00 mins.] The most important message is that the community needs to hear is that any repair work on this jail is not going to change any meaningful permanent answers to space-related issues such as medical booking classifications or programs and that’s one of the things that’s really made him supportive of furthering the debate about replacing the existing jail. On a couple minor issues, on replacing the generator – have they considered LED lighting to lessen load or other technology? Mike Russell: They have changed out the lighting in the entire jail, not to LEDs though. Difference in cost between LEDs is $15 a bulb compared to 98 cents a bulb. It’s not in the budget. They would have to put it in the Facilities’ budget for 2019 in order to make that change. He doesn’t think there would be enough reduction in load to make a big difference. Lauri Strauss: The lights won’t lessen the load enough to accomodate the refrigeration unit. HVAC equipment creates the biggest loads. You would have to replace HVAC equipment to reduce the load which would be a bigger cost. This entry was posted in Blog Post, Commentary, Information, Meeting and tagged Barbara Brenner, design2 LAST, Human Justice, Human Rights, Incarceration Prevention and Reduction Task Force, Jack Louws, Jail Overcrowding, Jail Sales Tax Intialtive, Ken Mann, Lauri Strauss, Mass Incarceration, Mike Russell, November 2017 Election, Prison Industrial Complex, Racial Justice, Rud Browne, Satpal, Sheriff Bill Elfo, Social justice, Todd Donovan, Whatcom County, Whatcom County Executive, Whatcom County Facilities Management, Whatcom County Jail. Bookmark the permalink.